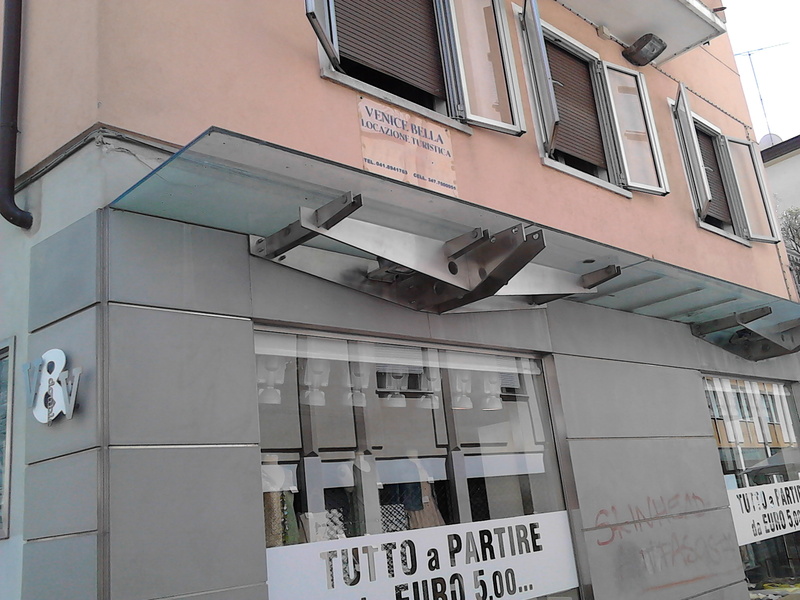 After a three and a half-hour train journey from Rome I arrived at Mestre railway station and hailed a taxi. He couldn’t take me to the door as it was in a pedestrianised zone and told me that it wasn’t far and described how to get there. After trudging around for twenty minutes looking for the place I arrived exhausted at the door. I knew I had arrived at the right place, not because of the grandiose neon sign above the door but because of the small card in the intercom system of what appeared to be a block of flats. I rang the bell and a man answered and I told him that I had a reservation but he didn’t reply or open the door. I rang a few more times with no response. I then pressed another bell at random hoping someone would let me in. A lady popped her head out of a window on the top floor and I explained in my broken Italian the situation. She opened the door and I stepped into the hallway. The lady came down and knocked on the door of the Hotel apartment but got no reply. 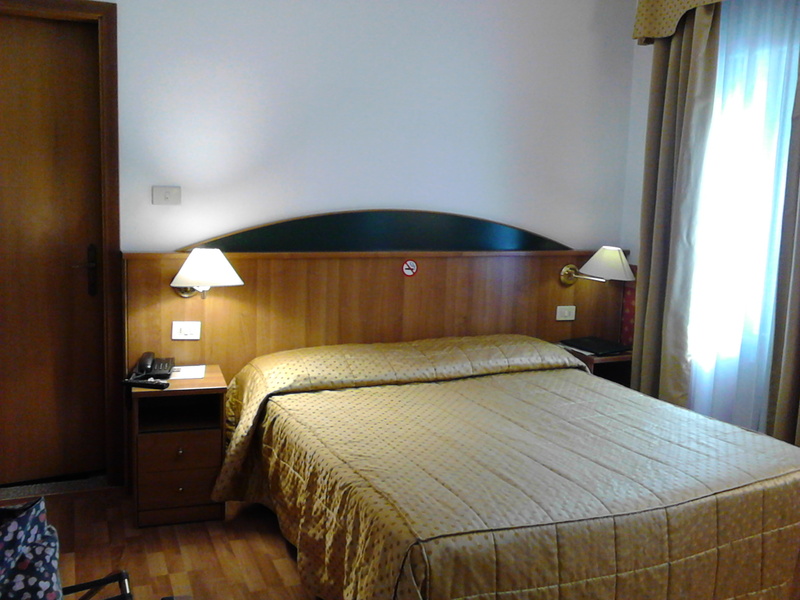 She came down to me and I thanked her and said that I would look for another hotel; I’d booked it whilst in Rome at a public Internet point and used the same booking company that I’ve used often without a single hitch. We both left the building together and she went on her way. It was then about 6:30pm, a few miles from one of the most popular attractions in Italy in peak season and I was worried. The place was quiet and I headed back up the path looking for another hotel. 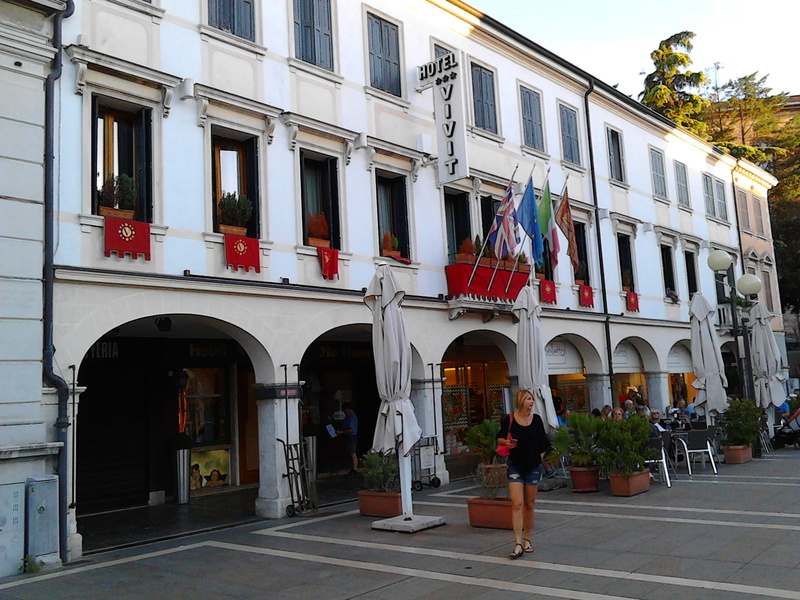 I’d walked less that ten minutes when I entered a square and looked around and saw a hotel – Hotel Vivit. I walked in and took the lift up to the reception. I needed three nights and waited anxiously as she looked through the book. I breathed a huge sigh of relief as she said there was a room available. I received an email from the other hotel about my “no show” when I got home which was in Spanish. Since my Spanish is non-existent I replied to them in English. ¿Cómo estás? 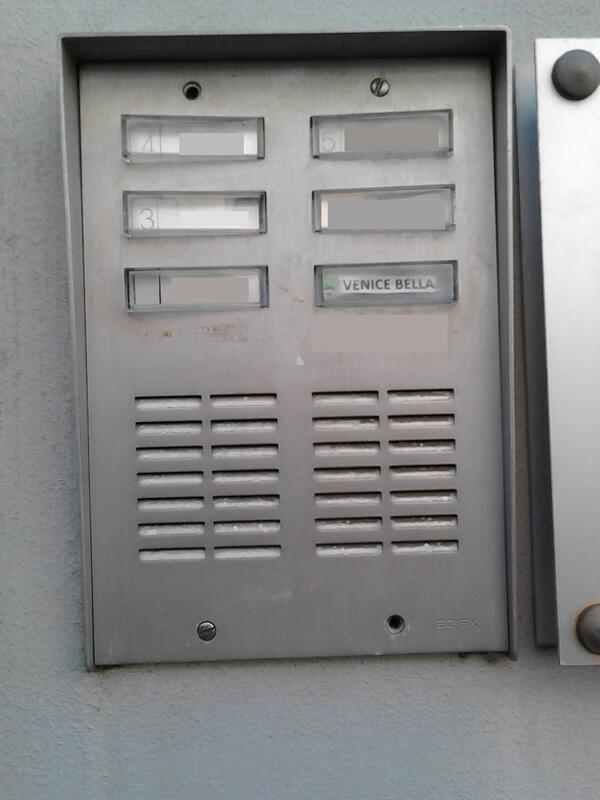 El Venice Bella (número de reserva 1476169936) nos ha avisado de que no hiciste el registro de entrada el 2017-08-12. Copyright (c) 1996-2017 Booking.com. Todos los derechos reservados. Thank you for your email. Unfortunately I don’t speak Spanish but I assume that your email relates to my “no show” at your hotel on the 12th August 2017. In the early evening of the 12th I arrived at the hotel and was unable to gain access. On pressing the bell a man answered but did not unlock the front door. On repeated calls he did not answer. Fortunately a lady from the top floor let me in and came down and knocked on the hotel door (1st floor). She didn’t get any response. We both left the building and I booked into another hotel. I would appreciate it if you would refund my payement (£157.42) plus an appropriate sum as compensation. 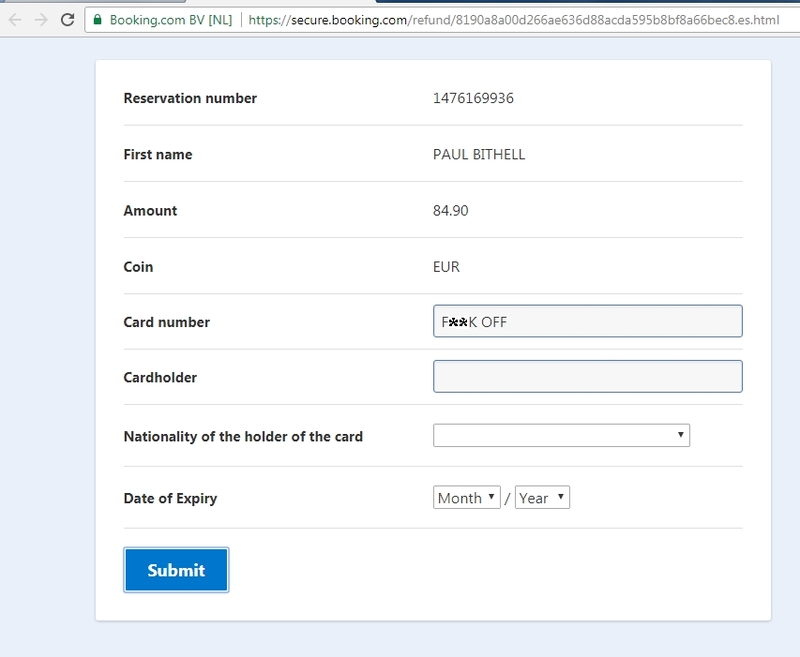 Thank you for contacting the Booking.com Customer Service team. We sincerely apologise that Venice Bella was not able to honour your reservation. We would like to make sure that you were able to stay at an alternative accommodation with minimum inconvenience to you, and if you incurred any additional costs due to this situation, please send us copies of your receipts. We will assist you in any way possible. Once again, please accept our sincere apologies for any inconvenience this situation might have caused. Thank you for understanding, and we hope to be of service to you in the future. Click here to view and change your booking at any time. I then received an email from them in Spanish, which contained a link to a form asking for my card details. This was also in Spanish so I used the translation tool on the page. Before entering anything, I scrolled through the ‘nationality’ box to enter my nationality but ‘British’ was not included. Neither was ‘United Kingdom’ or any other suitable entry to state my nationality: I scrolled from top to bottom three times. I was convinced it wasn’t genuine, I came to the conclusion that it was either some nasty “entity” trying to give me hassle or an attempt to steal my card details. Either way I submitted the form but they didn’t get the information that they wanted. However, when I logged on a few days later to take some screen shots of the page, “United Kingdom” was in the list. I contacted Booking.com and asked them to arrange an alternative method of payment. Thank you for your attention in this matter. 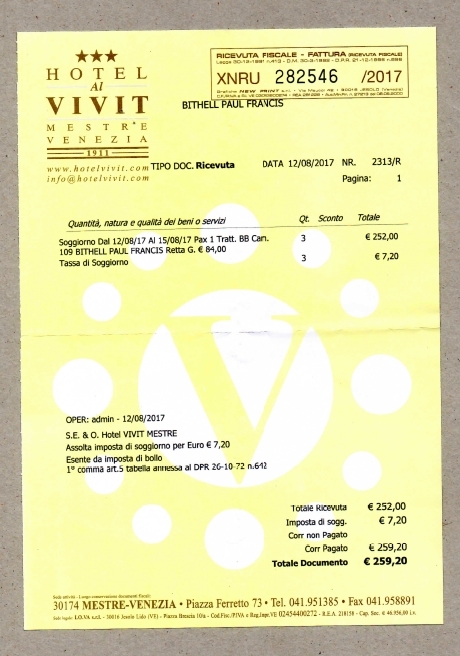 Can you please ask Venice Bella to send me the compensation (€84.90) by post as I found the form requesting my bank details to be suspicious. I have received no reply from VENICE BELLA/BOOKING.COM and I have re-sent the email. You are currently browsing the Pyethon's Blog blog archives for September, 2017.